Welcome to the most accurate and informative NFL Draft site on the web! Hi, my name is Matthew Gambill and I am a freelance scout from New Orleans. I have been doing NFL Draft analysis for years now, and I want to share my thoughts with all of you. I started making mock drafts for fun about 10 years ago, and now scouting future NFL stars is my LIFE! I know what NFL GM's are looking for and I will provide all of you with inciteful information throughout the draft process. So sit back and enjoy!!! As I look at more and more game tape, it becomes more obvious that this draft should be a pretty good one. The QB's will be weak, but as I go through other positions, there is an abundunce of quality NFL talent. The position that has impressed me more than I thought it would is CB. With the emergence of small college stars like William Peterson, Ligarius Jennings, and others, this position is shaping up to be VERY strong. There may be as many as 8 corners taken in the first two rounds!!! Another position to watch out for is WR. With Underclassmen like David Terrell and Koren Robinson in the mix, this is by far the deepest position in the ENTIRE draft. It will be interesting to see where the top seniors like Santana Moss, Rod Gardner, and Quincy Morgan will end up. I'll be updating my site regularly, so check back to see what new stories I have for you. Please e-mail me your comments or suggestions. I'd like to know what everyone thinks about this site. 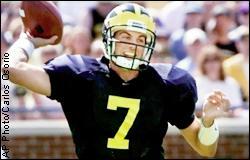 Drew Henson, Michigan's talented trigger man, has decided to stay a Wolverine for his Senior season. Henson has dreams of a Heisman trophy dancing in his head instead of dollar signs. Good decision Drew!!! The money will be there in 2002. One guy who impresses me more and more as the draft nears is Kevan Barlow, the big, physical RB from Pittsburgh. In early September I had Barlow rated as my #10 Senior RB prospect and #14 overall RB prospect. How times have changed. Barlow is now my #3 Senior RB prospect and #4 RB prospect overall. He combines great size and strength along with the ability to get outside. He's physical enough to run between the tackles and wear down opposing defenses. I wouldn't be surprised if Barlow's name is called in the 1st round. He's one to keep an eye on as the draft approaches. Another Oregon State player is really making some BIG moves up draft boards. His name is DeLawrence Grant. He's a 6'3, 261lb DE and he's got the all-around game a pro DE must have. As of now, I have him rated as a second round selection, but don't be suprised if he creeps into that first round tier soon. I'd like to thank everyone who has visited and supported my site through it's first 8 weeks of operation. Please pass the word out and keep coming back. Be sure to sign my Guest Book so I know what you guys think of the site. Thanks. Click 4 More - Top 100 Sports Sites!